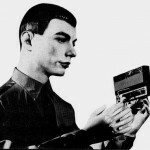 Kraftwerk are widely regarded as one of the most influential groups in music of all time. Namely for their pioneering work using synthesizers and drum machines but also for their distinct melodies. They have been cited as an influence from musicians such as Madonna, David Bowie, and Michael Jackson. They are one of the most sampled groups with their melodies and beats appearing in rock, pop, and hiphop. Their music has been heavily sampled or covered by artists such as Afrika Bombasta, U2, Coldplay, and Will Smith. 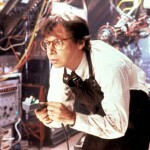 One artist who also covered them, was Rick Moranis. As in Honey I Shrunk the Kids and Spaceballs and Strange Brew Rick Moranis. Thus creating the single greatest cultural crossover since that guy who played the Doctor or Doctor Who is the bad guy in the forthcoming GI Joe movie. Or when The Jetsons were on The Flintstones. The cover was released on Moranis’ now out of print 1989 EP You, Me, the Music and Me. I guess after looking at these two images I can see the connection.